Although time may seem to stand still in this peaceful spot, The Summit Church’s elders have always had their eyes fixed firmly on the future. This was very evident in the church’s recent expansion, which included the installation of a very versatile LED lighting system by Stark Raving Solutions that features CHAUVET Professional fixtures. 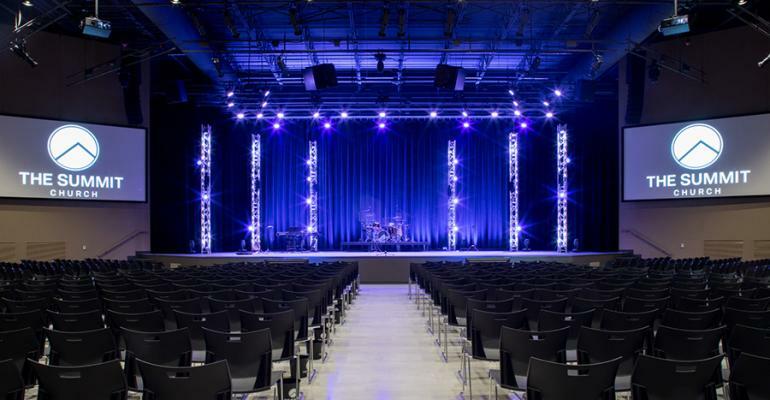 Initial plans called for the church’s stage to be illuminated with warm white key lights, with a few of the Ovation E-910FC RGBA-Lime ellipsoidals in the mix for color. However, during the project, the decision was made to make all the key lights E-910FC fixtures. Stark Raving Solutions installed 16 Ovation E-910FC units with 26° lenses in FOH positions at distances of 22 and 26 feet from the stage. Having the lights at two distances expands the coverage area and allows interesting overlays of color during youth services and concerts. As part of its rock concert reach out to younger worshippers, The Summit church also has nine Rogue R1 FX-B fixtures in its new rig. With each of the Rogues having five independently controlled moving heads, this gives the church a total of 45 different movers to use for energizing musical performances. 600MHz… What’s the Big Deal?